Home / Mi-Plan Financial Planning Software / What is the Mi-Plan Investment Planning Software? 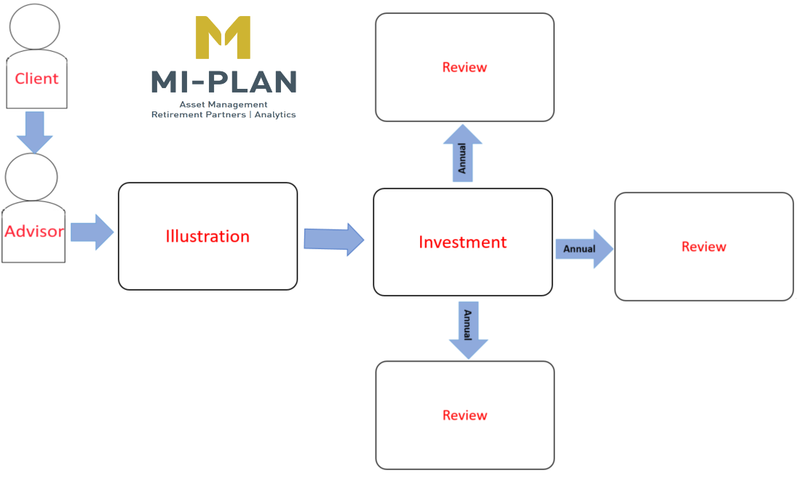 What is the Mi-Plan Investment Planning Software? The Mi-Plan software supports advisors, in helping to create optimized investment plans. This assists clients in planning for the future. The Mi-Plan Approach – Liability Matching based on time based risk management. MI-PLAN Retirement Partners believe that asset allocation is a key value proposition for financial planners. They have partnered financial advisors in providing them with the tools and skills as how best to optimise the client’s risk budget or how to allocate their assets. This liability matching process is based on strategic asset allocation principles that can then be mapped to focused investment mandates or funds. In each of these specific funds, the asset managers have a clear mandate as to where their tactical asset allocation skills can be applied, with very specific investment objectives in mind. As each client has different needs, cash flows and accordingly investment time horizons, this advice will differ from person to person. Finding the optimal mix between risk and return over different time periods offers the client the opportunity to seek the greatest returns on their money without taking risk that they cannot afford. Too little risk can be as bad as too much risk. There is no point in having a guarantee if the guaranteed return will not meet the client’s objective. Conversely buying too risky an investment that has a higher probability of not achieving its objective is equally risky. The MI-PLAN investment strategy implementation philosophy is based on the premise that time determines the optimal mix between risk and return. This philosophy combines three simple observations. From a return perspective only equities have shown after tax returns in excess of inflation over the long term. Based on this incontrovertible fact, any investor should want to hold equities. However from a risk perspective, equities hold you ransom to the greatest volatility or risk around these returns. Therefore an investor will often not want to hold equities. Fortunately time diminishes the volatility of equity returns. There is a ‘crossover’ point  from a time perspective in which the worst returns from equities are still better than the worst return from bonds and cash, after tax and inflation. Combining these observations provides the solution to finding a happy medium for the client. The asset mix (of bonds, equity, property and cash) the investor holds at any point, to meet a future liability, should be such that the volatility of the combined assets is reduced while ensuring that the portfolio has sufficient time to recover from any losses that result from the volatility of any individual asset class. Looking at it another way, an investor should hold the asset class with the highest potential return e.g. equity until the volatility of the particular asset class has the potential to have a material impact on the outcome of the client’s return objective. MI-PLAN’s simple, yet comprehensive programme provides advisers with a tool to analyse each client individually, based on their investors needs analysis data. This means that each client’s results are uniquely structured to their requirements. The programme determines the investment time horizon for the client;s different requirements and sets an appropriate asset allocation for each.